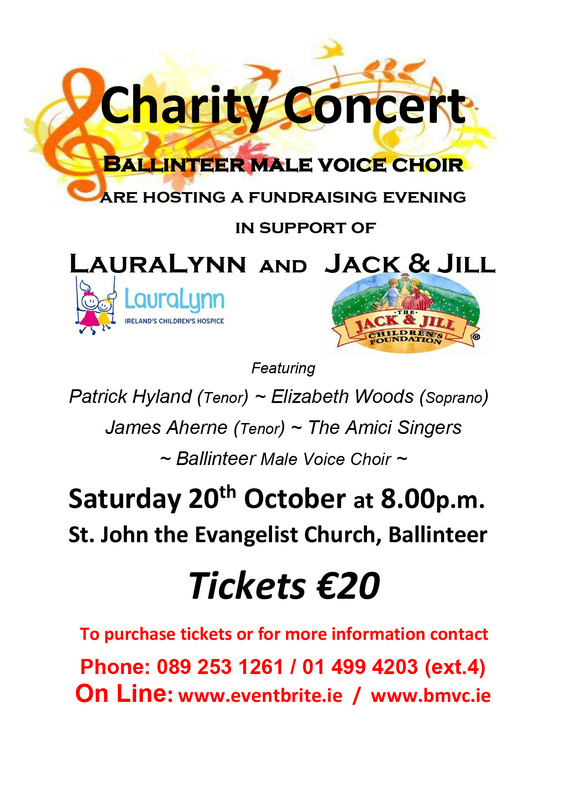 Don’t miss out on this very special evening in the company of the Ballinteer Male Voice Choir and guests who are very kindly hosting this wonderful Charity Concert. A truly magical evening of musical entertainment featuring two very talented tenors, Patrick Hyland(from Kildare), and James Aherne (from Ballinteer). They are joined by the lovely Elizabeth Woods (Soprano), the excellent Amici Singers and the Ballinteer Male Voice Choir. Both choirs are under the direction of Thomas Kehoe. We are delighted to be one the beneficiary charities together with LauraLynn Children’s Hospice to share the proceeds of this event. Avoid disappointment and book your tickets NOW, priced €20 on www.eventbrite.ie. For further information see www.bmvc.ie or phone 089 253 1261 / 01 499 4203 (ext.4). Here’s a little taster of the magnificent Ballinteer Male Voice Choir and what’s in store https://soundcloud.com/bmvc-325536231/she-was-beautiful.